NEWMANN, C.A. GEORGE. Newmann the Great. 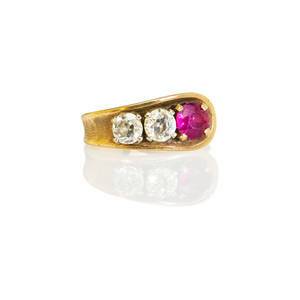 Ruby, diamond and 14k yellow gold ring; tapered strap with round faceted ruby, approx. .58 ct., and two oec cut diamonds, approx. .46 and .42 ct., second half 20th c. marked 585. 4.3 dwt.